Cleminsons from California hangover coffee cup mug 'Morning After' NEVER AGAIN painted in the bottom. Nice display piece for your bar or joke gift for that special drinking friend. Marked Cleminsons on the bottom. NO chips or cracks. Hand painted. Fun piece. Collectible pottery mug by artist Trudy Erwin Oracas Island Pottery one of the San Juan Islands in Washington State, famous for their pottery. 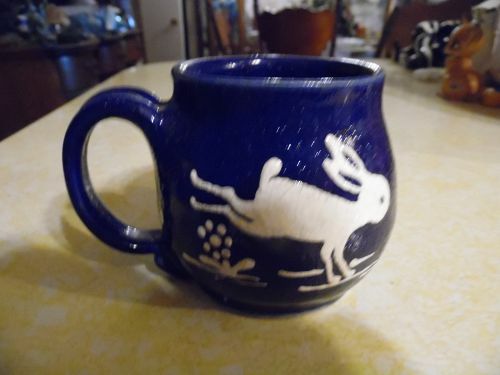 This cobalt blue pottery mug is decorated with white bunny rabbits in different poses. Trudys mother owned Orcas Island and Trudy was an artist. She passed at the age of 90 in 2013. She was very well known. 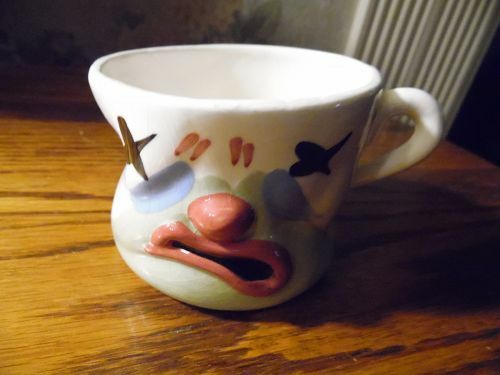 I have 2 of these mugs, and they measure 3 1/4" tall and are in perfect condition. Signed on the bottom Orca TE. Price is for each mug. 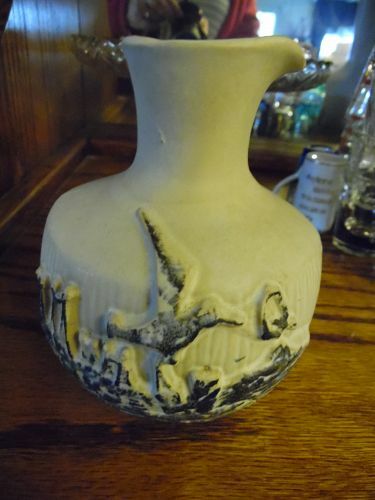 West German pottery vase by Bay Keramik. Relief pattern in tans and brown glaze. Marked on the bottom: BAY, W GERMANY A1 56. (The A1 could be something else but that's what it appears to me) Measures 29 cm (7") high, No chips or cracks. 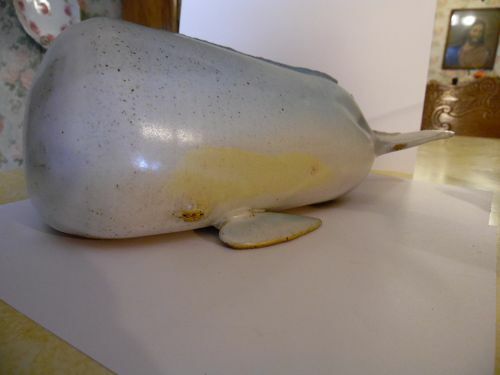 Awesome whale figurine is made from stoneware and has a great bluish gray speckled glaze. 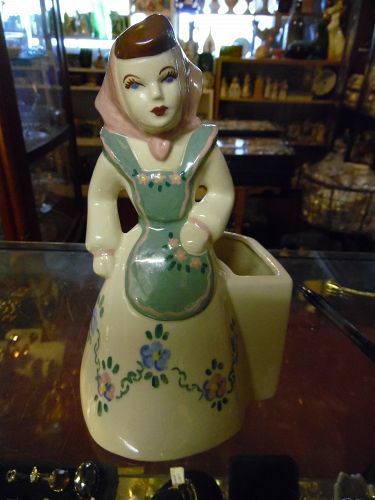 Measures 12" long and is about 5 1/2" tall. No damages. Stamped into the clay DEWEY. Detailed eyes, fins and blow-hole. This is such a great piece to add to your ocean themed collection. Beautiful console bowl with petals like a tulip or lotus, marked USA CAMARK and a number (which I can not make out with the glaze fill). Measures 8.5 x 11. Perfect condition. Is 3.5 in deep at the tallest point. 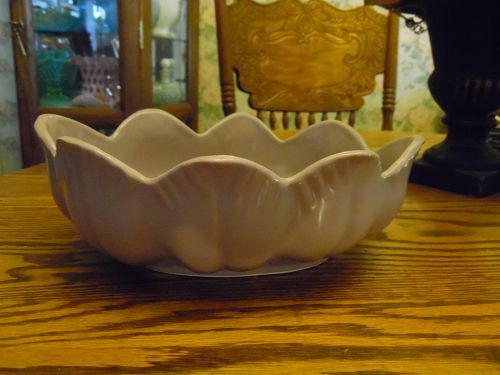 A beautiful lavender semi-matte glaze, and is in excellent condition with no damages at all. 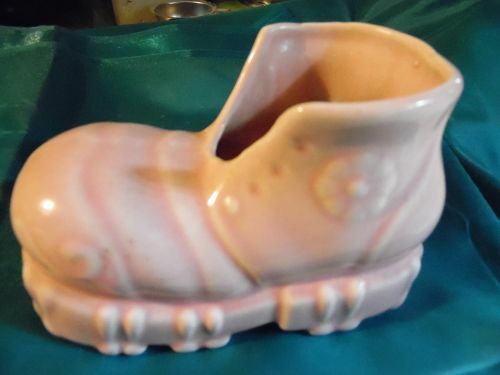 Cute shoe planter maybe a nursery planter, made by McCoy but unmarked. Pink with glaze. Shoe house is 4 1/2" long by 3 3/8 inches. Excellent condition. Great vintage gift for the little girl. 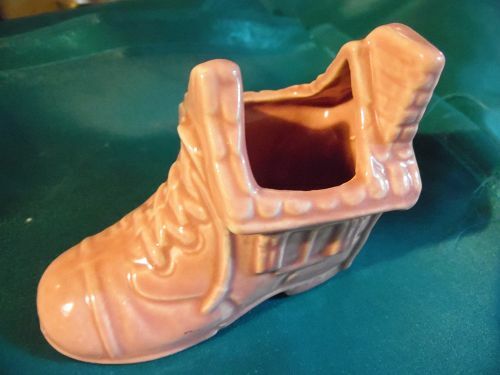 Vintage Ceramic Pottery Planter Boot Shoe nursery planter. Pink McCoy Cameron Clay NICE. Nice clean condition. Wonderful condition, with no damages or repairs. 6 1/4" long x 3 1/2" tall x 3" wide. 1920's vintage Brush Ware McCoy Pottery KolorCraft Mug. Excellent vintage condition. 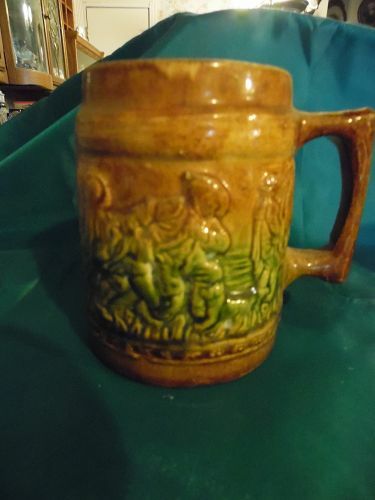 for this great old stein / mug. Nice colors and details of dancing people and a fiddle player. Measures about 5" tall. 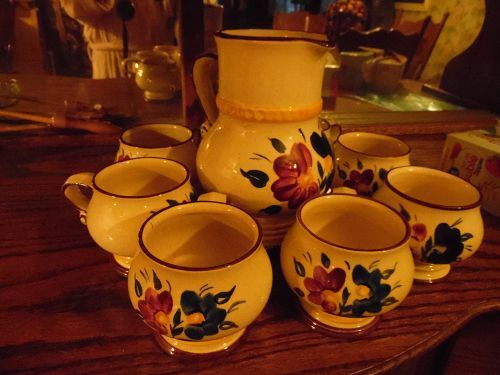 Hans Welling, Red & Blue Flowers/Yellow Pattern: Tegernsee by Goebel Hard to Find Pitcher with 7 large cups or mugs. Made 1967-1968. All pieces are in excellent condition. 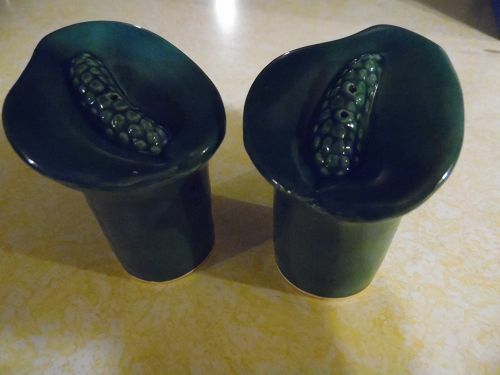 Vintage Calla Lily SALT PEPPER Shakers Green 3" tall. Mid Century California pottery.These Green Calla Lily salt and pepper shakers are in Excellent VINTAGE CONDITION. Originally belonged to a lazy susan set made by Sylvan's of Pasadena Ca. There are no chips or cracks. No stoppers, Approx measurements 3" H x 2 3/4" Diam. at the top and 1 1/2" Diam at the bottom. These shakers are in great vintage condition. There are No cracks or chips. FRANKOMA pottery TRIVET NIROGA 7th Nazarene International Retreat of Golden Agers Glorieta N.M. 1979. Rev Sam Stearman Director. Brown,with roadrunner and desert scene. Excellent condition, no defects, chips, cracks, etc. 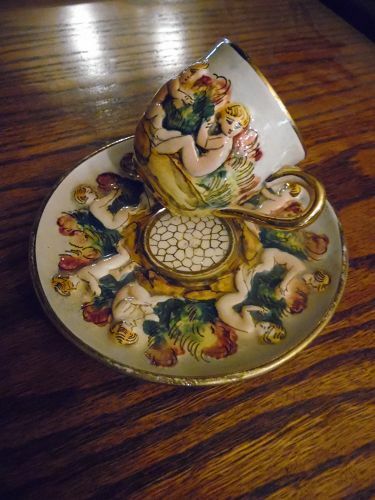 Capodimonte Covered Compote or Candy Dish. 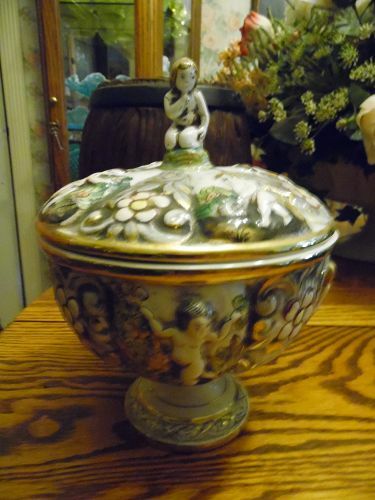 This Compote stands 8 1/2" tall to the top of the figure on the lid, it is 6 5/8" wide, its in excellent condition with no chips, cracks or repairs. 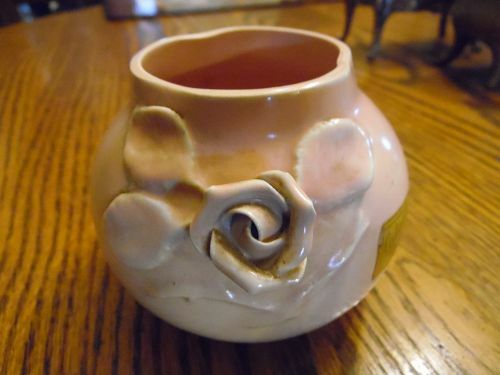 Shawnee Pottery vintage Hand Vase. 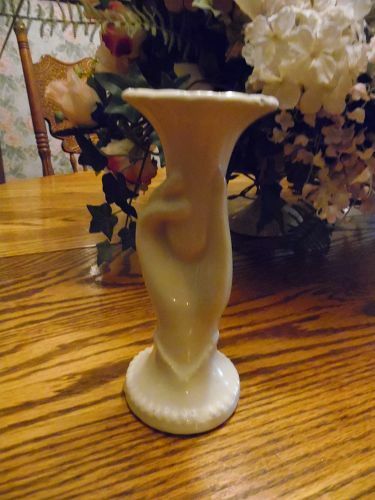 This creamy white colored vase is made in the USA Circa 1940. It stands almost 7'' high and 3'' across the top. This vase is also described as Lady's hand holding a Tulip. Some refer to as, holding a trumpet. It is in very good condition. No chips cracks or staining. Imperfections are all under glaze. Marked USA.